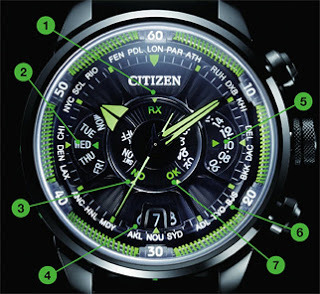 Citizen just announced the Citizen Eco-Drive Satellite Wave will be launched in September 2011 with a retail price of JPY336,000 including Japanese tax of 5%, which is about USD4000 less tax. It will be a limited edition of 990 pieces. Also unveiled was a teaser site for the watch. Unlike traditional radio controlled watches, the Citizen Eco-Drive Satellite Wave receives its time signals from GPS satellites, meaning it will be synchronised to the correct time anywhere in the world, as long as a signal can be received. In contrast a radio controlled watch only works in certain countries where the radio time signal is broadcast. The watch case measures 48.5 mm wide, and is made of ceramic and Duratec DLC-coated steel, on a rubber strap. It’s solar powered with a power reserve of 2.5 years when fully charged. When receiving the satellite signals it is dead-on of course, but without signals it runs +/- 15 seconds a month. And in addition to the time it has a perpetual calendar and world time function. Thanks to my good friend KIH for bringing this to my attention. Update Oct 2011: Live photos of one of the first Satellite Wave watches to be delivered- worth a look, it is really cool.